Cracklescape is a beautiful book, with the stylish writing that characterises Lanagan’s work. In some ways it is more literary than genre, where exploration of language and elegant passages and phrases are prioritised over plot. Despite its short length, I do not recommend coming to this book for a quick read. More than one of the stories that I read late at night before going to bed I found myself having to read again with a less sleep deprived brain to make sense of it. 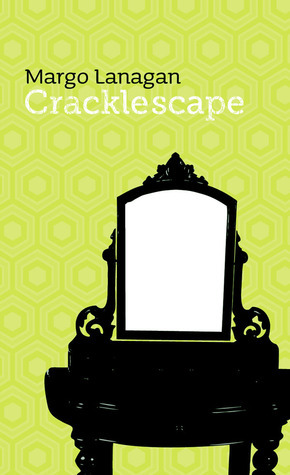 For this reason more than anything else, I appreciated and admired Crackescape without loving it. I recognise that this loses me genre-cred. The Duchess Dressor tells the story of a share house dweller who finds a duchess dresser by the side of the road. The dresser is cursed/haunted. This opening piece is filled with strong imagery, evoking sadness and quiet desperation with gorgeous prose. I was a little let down by the ending, the story just seemed to peter out. The Isles of the Sun involves a Pied Piper style engagement of alien/other worldly creatures with a town’s children. The ring leading child Elric was particularly well drawn here, with a distinctive voice and an almost cultish vibe to his engagement with the other children. Switching perspective to the mother for the last part of the story was very effective, and there was an ambiguity to the end which I found very appealing. Bajazzle was an uncomfortable read. The point of view character Don was very unsympathetic. In fact, all of the characters were unsympathetic but yet the story remained engaging. This story had a bit of raunch in it, which was vividly described and quite visceral. Significant Dust was probably the least genre of the stories, going back to the early 80s to describe a young woman’s retreat into a lonely existence working in a roadside diner in the Western Australian outback. The backdrop of the story is a UFO encounter, but the story itself doesn’t really have any genre elements. I thought this story was structured very effectively, with interspaced flashbacks that effectively filled in the reason for the lead character’s despair. I’ve been impressed with the whole Twelve Planets collection so far, and Cracklescape is a worthy addition to the series.